Uwe Westphal, journalist and historian, is the ‘go-to’ expert when it comes to the destruction of the Berlin fashion industry in the 1930s. In his impressive book Berliner Konfektion und Mode 1836-1939: Die Zerstörung einer Tradition, Westphal traces the story of Jewish men and women in the fashion trade, from textile dealers to tailors and retailers. Their struggle against anti-Semitic restrictions, a constant right from the earliest days of trading in second-hand clothes, came to a head when the National Socialists seized power in 1933. Westphal tells the story of the ‘aryanisation’ of the industry, the destruction of a whole way of life in Germany, and the forced emigration of many. It was Westphal who was responsible for exploding the myth (evidently a Nazi invention) that 90 per cent of clothes businesses in Germany in the 1930s were Jewish-owned - the reality was a far smaller percentage. Ehrenfried & Cohn, also only in German so far, is Westphal’s first sortie into fiction. In an interview which appears online, he explains that after his factual book was published, he received many letters, photographs and eyewitness accounts from people whose families had worked in the Berlin fashion sector and, as he said, ‘I decided to condense these individual experiences into a single story about one fictional firm.‘ The novel is set in Berlin in 1935, around Hausvogteiplatz, the beating heart of the prêt-à-porter trade. (In the second edition of his factual book on the subject, Westphal tells of his attempts in the 1980s to have a monument erected in that square to the Jewish victims of Nazism, only to have his idea dismissed by GDR officials as part of capitalist history.) Kurt Ehrenfried is the assimilated Jewish-German businessman, who has left behind the traditional ways of his more observant father to create a successful contemporary women’s clothing business. He embraces the new practice of advertising, he uses technology to produce up to 20,000 garments a month when there is the demand for it, and he knows the right people to employ as designers, buyers and office staff. He is married with young children and has a comfortable lifestyle, surviving the upheavals of the 1920s by constantly adapting and learning. His partner, Simon Cohn, represents another type in the sector, the creative director – it is his eye which ensures the right decisions are made with regard to design and detail. Cohn is gay and thus typical of a significant percentage of those engaged in the fashion business, an aspect which is generally underrepresented in research but which Westphal, from his comprehensive study on the subject, is familiar with. Berlin was more liberal in those days than was London, hence becoming a home to Christopher Isherwood and others in the 1930s. The novel follows the prêt-à-porter teams from Berlin on one of their regular trips to Paris, where they see the couture shows and try to copy the latest designs to send home. But their enemies from the newly-created ADEFA, the organisation set up to promote ‘aryan’ clothes businesses in Germany, conspire to bring about their downfall in one exciting chapter. Inevitably, the ‘centre cannot hold’, as one of the characters quotes from W. B. Yeats, and the plot becomes the story of the struggle of the two main characters and those they work and trade with to survive against all the odds as the National Socialist stranglehold tightens on them. Every element of this fascinating story is there and yet the fictional style of Mr Westphal is a little flat: some parts read more like a well-researched case study. An interesting comparison might be the much more lightweight Some Girls, Some Hats and Hitler: A True Story, an autobiographical account by the Viennese milliner Trudi Kanter, written many decades after her heyday in the 1930s. The story is similar, yet, as Linda Grant says in her introduction, the fiction fizzes. 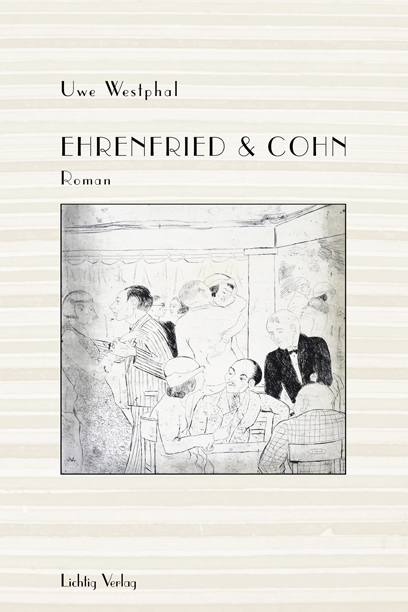 Nevertheless, Ehrenfried & Cohn makes for fascinating reading; the plot carries the reader on. And one hopes, as Uwe Westphal mentions in his interview, that it will be made into a film – it is a dramatic and visually rich story and one which must be told.